Super-portable and convenient PA system that will go where you go, and keep you sounding great. 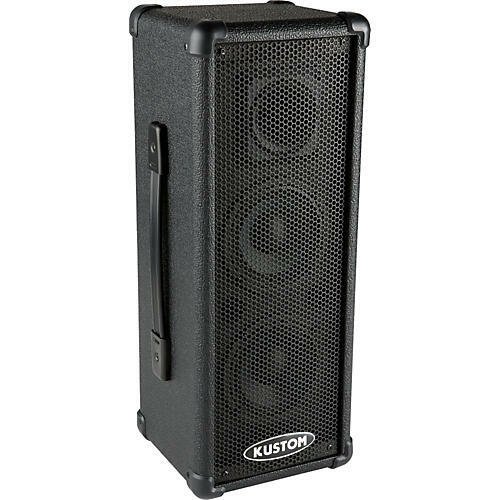 The PA50 PA System from Kustom combines quality performance and convenient features, all in a highly portable package. You'll find that the PA50 works well in a variety of environments, amplifying vocals, instruments, keyboards, drum machines, audio devices, and more. The two 4.5" speakers and high-frequency driver provide just the right combination of high and midrange sounds. This balance ensures your vocals cut through the mix while minimizing harsh and unwanted frequencies. The PA50 Construction is based on the same tried-and-true techniques as the rest of our speaker line. This includes a heavy-duty steel grill and rigid corners. This model also utilizes a high-frequency driver for crisp, accurate reproduction of treble frequency and articulate speech. For the soloist or acoustic duo, the PA50 works well when positioned on a standard speaker stand. As your following grows, so does your sound system; multiple units can be connected to increase the sound coverage in your venue of choice. Get this portable PA solution today, and you will be ready anytime anyplace.